The importance of 19th century photographs as a source for the study of Victorian fashion has been well documented but another classification of photography that allows us to revisit the past is occupational portraits. 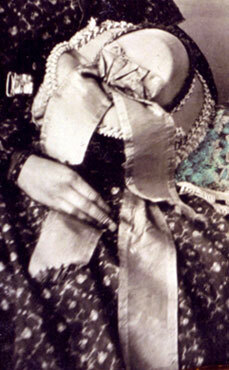 Nineteenth century photographs featuring the subject employed in a period occupation or hobby are fascinating. The subject of the photograph is seen with the tools of his trade or goods that he has made. The daguerreotype was the first commercially developed photographic process introduced by Louis Daguerre in 1839. Most early occupational daguerreotypes portray tradesmen, such as cobblers, carpenters, and blacksmiths. But by the mid-1850s the daguerreotype had been largely replaced by the ambrotype, a faster and less expensive photographic process that used a glass plate rather than polished metal. 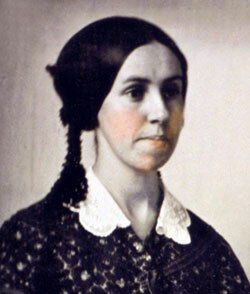 The occupational portrait featured is a circa 1854 quarter-plate ambrotype of a milliner. 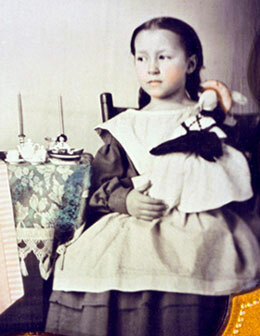 The photograph shows a woman and girl seated at a table with bonnets and a doll. 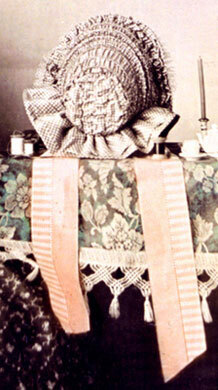 Also highlighted are her “tools of the trade” — a thimble and several spools of thread. It is noteworthy that occupational portraits of women taken during these early years of photography are exceedingly rare. How Queen Victoria's vacation retreat influenced Victorian fashion.